Fitted Carpets are available from Bromley and Able, the specialists in home furnishings. We have a wide range of carpets in stock to suit your tastes and requirements and some of our carpets can be viewed at our website where you can find further information about the sizes and thicknesses of pile available. Browse our range to see living room carpets, hallway carpets and even bathroom carpets in a variety of colours and patterns. We pride ourselves on offering a great selection of quality products, so we are sure that you will find a carpet you will love when you come to us. Fitted Carpets from Bromley and Able can be expertly installed by our team. Once you’ve selected your carpet, we will be able to provide you with a full quotation including all the costs of underlay and labour. We can then come into your home and carefully install your new carpet with minimum disruption to your daily life. All of our staff are highly trained and professional, so you are sure to be glad you chose Bromley and Able. To view our products, which also include bedroom furniture, laminate floors, vinyl flooring tiles and dining tables, please take a look around our website. To make an enquiry please fill out the contact form on our website and we will get back to you as soon as possible. 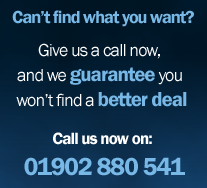 You can also call us on 01902 880541 to discuss your order. Bromley and Able Carpets is based in the West Midlands, UK.